Detailed street map of Boston and vicinity. Cram's Street Map of Boston. 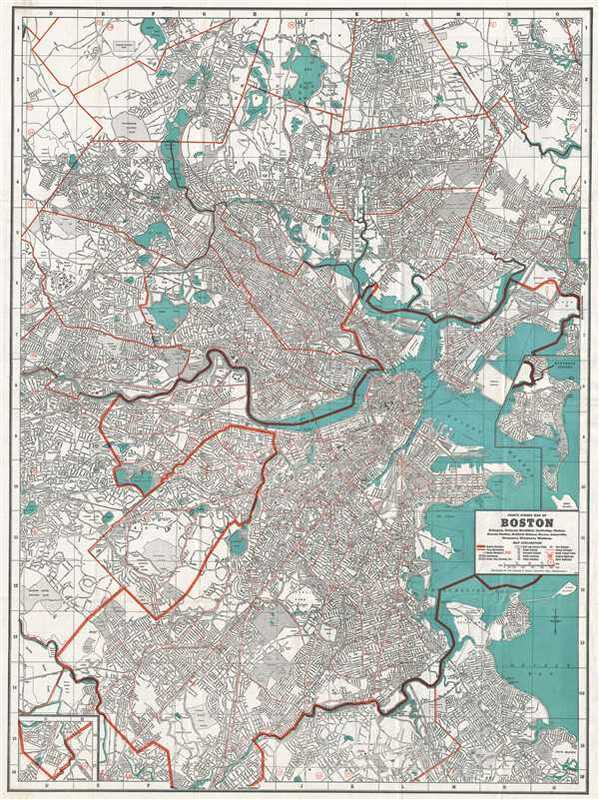 This is a beautiful 1939 map or plan of the city of Boston, Massachusetts and its surroundings issued by The George F. Cram Company, Inc. It covers from Woburn south to Hyde Park and from Belmont east to Boston Harbor. Includes the areas of Arlington Belmont, Boston, Brookline, Cambridge, Chelsea, Everett, Malden, Medford, Melrose, Revere, Somerville, Watertown, Winchester, and Winthrop. The map is extremely detailed and notes individual streets, neighborhoods, ponds, parks, bridges, buildings, lakes, cemeteries, roads, railways, island, rivers, and a host of additional topographical features. Two insets detailing the Winthrop Extension and Southern Extension are included. Verso features four additional maps depicting the Boston elevated railway system, Boston business and hotel district, trunk highways, and a regional map. An index of places of historical interest, public buildings, theaters, hotels, etc. Issued by The George F. Cram Company, Inc. Very good. Minor wear along original fold lines. Minor foxing. Accompanied by original binder and 32 page guide.